My Faith and Trust in my Lord are stirred up by the Spirit of my Lord and Rises From the Depths of my soul, heart and spirit. *Looks around...Sees New challenges bringing new changes, Hears new challenges and changes coming quickly! Wonders Where Am I? Ohhh, I'm In the midst of Spiritual Testing = New Challenges bringing New Changes. . These challenges and changes are new. I don't Know what to do, when to do it or How to do it. But, I Do KnowWho Does Know what to do, when to do it, and How to do what Needs To Be Done, my Lord Jesus! I See Him, He's Calling me To Come To Him! Lynda, Lynda, satan seeks to Sift you Like Wheat! But Do Not worry Or Be afraid, I Have Prayed Especially For you Lynda, That your own Faith Will Not fail And when you yourself have made it through these testings, Remember to Strengthen And Help your sisters and brothers! No doubt that challenges Always Bring Changes... Accepting these Changes sometimes is Harder than going through the challenges And the changes themselves. 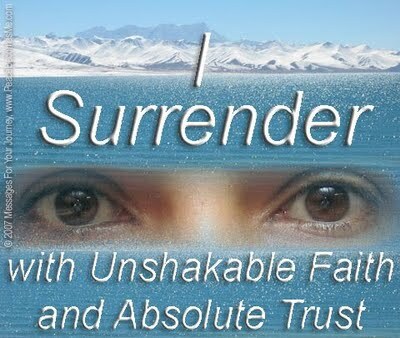 Remember Not to resist, surrender completely To God's Will, Plans & Purposes, And Look for the Good that He Always Adds to any challenge and change.Remember that God Is Turning Everything to Good. God Wastes Nothing! He Will Use Everything we Give Him to re-position us, so that we are aligned with His will, plans, and purposes. Where you Are Now, what you See and Hear now, Is Not the End! Jesus told us God's Holy Spirit is here with&for us. So ask The Holy Spirit to Stir up the Fire in your heart, to renew, refresh, rejuvenate, your gifts, in the name of Jesus. Stay With Him As He Moves You Toward What Will Be! Too many miss out on the Victory that God has planned for them, because they look around at the changes that challenges bring forth, and spend large amounts of energy, time and strength fighting against accepting them. They may get through the challenges, but they resist accepting the changes, which greatly hinders any forward movement Into the New Beginnings that God has planned. They believe that what they don't see or hear is the End of things and they stop where they are. They become spiritually complacent. They give up on God's Love, they give up on Trusting by Faith, they give up Expecting Him, so they never get to The Victory and His Glory that is at the End of the Thing! Acceptance allows us to Be Moved Forward, Toward The Next Glory of God, to the Victory He has already planned for us. So in other words, the faster we accept the changes, the faster we grow and mature, the more we are prepared to Be moved forward. God's Got This, In the Name of Jesus, So Be It!